Over and Out — Mora lays down the law that will kill the tradition: If you join the “Over-the-Wall” practice-ditch, DON’T COME BACK! For those of you who don’t know, for about three decades, UCLA Football has had an on-again, off-again tradition of players bolting “over-the-wall” to blow off practice for one day, in a mutiny-styled showing of player solidarity. Former Coach and former player Rick Neuheisel is one of the few people who have been on both sides of the fence on the wall tradition, embracing it as a player, and dreading it as a Coach. There are definitely two sides to this controversy, but most fans and Media sources seem to view it as a lack of commitment to excellence. I see both sides. It’s good for the players to have traditions, and events that bring them together and build team unity… However — There HAS to be a better way than to bite off your nose to spite your face. This team, like many before it, NEEDS all the practice they can get. They have shown poor fundamentals and inconsistency all year long, and the only cure for that is lots of practice. There are a lot of ways that the team can bond, without costing them valuable field time. The message sent by bailing on practice is that it’s okay to make Football a low priority. It’s an insult to the Coaches, and a real slap in the face to any recruits or high school Coaches that have come to observe practice, let alone the FANS who have come from miles away to be in attendance (assuming the stunt is pulled during the part of practice that is open to the public). When you are on a LOSING team, your goal should be to get better, ON the gridiron, and not let the rest of the Country think that you don’t take Football seriously. Apparently, new Bruin Head Coach Jim L. Mora — and Athletic Director Dan Guerrero — both agree with this latter perspective. Mora, with Guerrero’s full support, came out with a clear statement on the issue, after the team pulled the prank this week. Mora said that the CULTURE has to change around here, and that anyone who goes over the wall while Mora’s in charge, can just KEEP ON GOING. No one who participates in this mutinous activity will be allowed back on the practice field. Good for Mora, and Guerrero. A ditch-day needs to be EARNED, by winning big, by beating sc, or by winning the Conference, AND EVEN THEN, it still should be a last-ditch effort to have a tradition. Like I said, there are a million different, BETTER, less costly ways to gel, without making a statement that winning is secondary. It will be interesting to see if Mora’s message GETS THROUGH to his players. Will they have enough respect for him to heed his warning? And will he have the balls to stand by his words, and thoroughly punish any participants in a repeat-performance, especially the instigators? And what if the entire team jumps the wall? Will he forfeit a game? Will he replace the whole roster? Hopefully these questions will be moot, because next year’s team will be dedicated to Mora, and to improving the state of the Program, and won’t even CONSIDER climbing that wall. 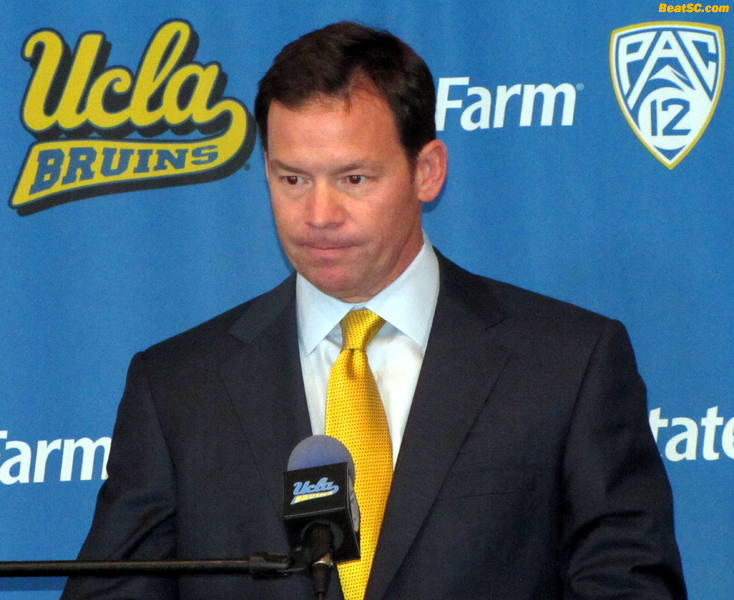 "MORA-BANNED = MORIBUND" was published on December 22nd, 2011 and is listed in Blue & Gold News, UCLA/usc/Sports Photos. Loved it. I hope Mora’s spring practices are like Coach Paul Bryant’s ala The Junction Boys; get rid of all the softies on the team.